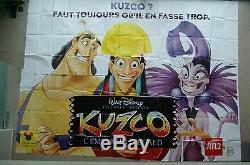 HUGE RARE 160" x 120" 8 panel billboard poster THE EMPEROR'S NEW GROOVE DISNEY. LARGE 100 % ORIGINAL HUGE VINTAGE BILLBOARD SIZE POSTER!! VERY GOOD CONDITION - NEVER USED - ISSUED FOLDED!! VERY BRIGHT COLORS , HAS NEVER COME OUT OF STORAGE SINCE IT WAS ISSUED!! TITLE : THE EMPEROR'S NEW GROOVE KUZCO YEAR : 2000 DIM. 160 " inch x 120 " inch French 8 sheet issued folded!! 4 meter x 3 meter!!!! _gsrx_vers_568 GS 6.7.3 (568). The item "HUGE RARE 160 x 120 8 panel billboard poster THE EMPEROR'S NEW GROOVE DISNEY" is in sale since Thursday, May 29, 2014. This item is in the category "Entertainment Memorabilia\Movie Memorabilia\Posters\Originals-International\2000-Now". The seller is "geoconde" and is located in Oostende. This item can be shipped worldwide.